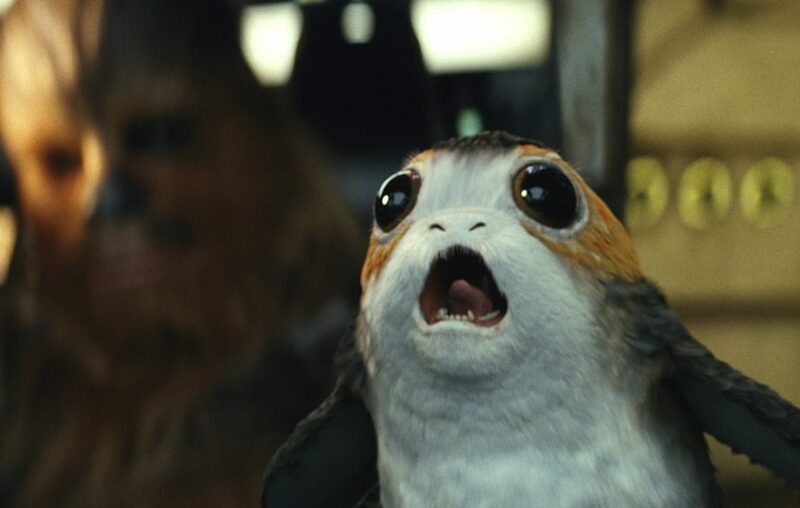 I had written a movie review of Star Wars: The Last Jedi and I found it pretty difficult because I did not want to spoil anything. There are reviews that were released prior to the film being released (hello Variety) that told too much about the twists and the story. I did not want any part of that. So it made the review difficult. However, now, with the specific title of this piece including the big word -SPOILERS- I decided to write my thoughts about the movie with full impunity. I want to start with my favorite scene in this movie, which was the face-to-“face” meeting between Leia and Luke. When Luke arrived to see Leia, they spoke, Leia made a joke about her hair and it was as if these two characters had been together since day one. Luke gave a kiss on the forehead to his sister before heading out to confront her son/his nephew. It was meant to show Luke saying “goodbye” to Leia before he met his end. However at this point, a year after the loss of our beloved Princess, it played more like Mark Hamill getting a chance to say goodbye to Carrie Fisher. I know that is not what the scene was meant to do, since Carrie Fisher survived the filming of this movie, but with her devastating untimely passing, it brought on a different layer. And it was so beautiful. Some people have complained about the new powers that the Jedis seem to have gained that have never been their before, but that does not bother me in the slightest. We do not know the powers that a Jedi can muster, and, just because we had not seen it happen before, doesn’t mean that they couldn’t have done it. The Force projection ability certainly seemed to be one that was going to take its tole on the Jedi and, thus, made sense as to why it is something that has not been used. Meanwhile, it was used extremely well to further the connection between Rey and Kylo and perfectly at the end to have Luke face off with Kylo. Speaking of that fight at the end, I LOVED it. The way Luke was “trolling” his nephew during that whole encounter was just tremendous. I did not see it coming, but, if you look back, there are hints here. For example, Luke, when walking on the salt planet surface, did not make the red marks that everyone else made, including Kylo. When Luke walked out of the barrage of cannon fire unharmed, I thought to myself, wait, how did he do that? I was extremely pleased by the answer. Plus, the end of the scene, when Force projection Luke disappeared, he gave the line “See ya around, kid,” to Kylo, just like Han Solo, sticking it to the young Ben Solo once more. It was a perfect end to that confrontation. I was not as huge of a fan of the storyline involving Poe. There was a running plot thread that seemed to be trying to teach Poe a lesson of not being such a “jump in an X-Wing and blow stuff up” guy and, instead, be more of a leader. The first time I saw The Last Jedi, that storyline bugged me a bit, but it was better in the second viewing. The problem was, so much of the troubles that happened aboard the ship came directly from this attempt to teach Poe how to be a leader that it was hardly worth it. Had Laura Dern just told Poe that she had a plan and had given him a heads up about it, nothing would have come from it. Poe would not have mutinied. Finn and Rose would not have headed off to find a Master Code breaker to sneak aboard the Star Destroyer, they would have never met up with DJ (Benicio Del Toro), and the First Order would never have gotten wind of their plan because DJ would not have given them up. Because she refused to trust Poe, one of the greatest pilots in the Rebellion, nearly the entire Rebellion had been blown up before they ever got to the planet’s surface. Leia had criticized Poe for not turning around at the beginning of the movie when he wanted to try to finish the plan to blow up the Dreadnought and had told him that the loss was too great, but doesn’t that same philosophy include her old friend Laura Dern? I have to say as well that despite being one of my favorite parts of The Force Awakens, I was not a fan of BB-8 in this movie. I thought the droid lost most of its charisma and humor and was replaced by a killing machine. One thing I really loved was how the film took two of the biggest, most debated mysteries among the Star Wars fans and gave answers to them that were anything but memorable. The first one was “Who is Snope?” That was made perfectly irrelevant after the Supreme Leader was cut in half by the lightsaber. Who was he really? It did not matter in the story. The second one was “Who are Rey’s parents?” It turns out that Rey’s parents were nobodies, drunkards who had sold her off as a child. I was very pleased at this twist considering how much everyone debated about Rey’s parents (Obi-Wan, Han and Leia, Luke etc). The fact that they were nobodies (from Nowhere, as Rey had said herself earlier in the film) means that anybody can become a special person, someone at one with the Force. It did not just have to be a Skywalker or a descendant of a Jedi. It kind of took away that clubhouse that the Jedis had owned for so long. I loved that. I think I did mention this in the main review, but I hated the trip to Crait. It was the biggest waste of time in the entire film, and it was also the point when I was originally watching it that I thought to myself, “Is this going to be it?” I had a moment when I thought that maybe the Last Jedi would underwhelm me as some other movies have done. Fortunately, the film picks up BIG time after this, but the entire sequence on Crait could have been cut out. That included everything with DJ, whom I really disliked. The coincidence alone was hard to handle, as Finn and Rose, who had come to Crait in search of a Master Code Breaker (directed there in a wasted cameo from Maz Kanata), wound up getting arrested and thrown into a prison cell with… you guessed it… a thief who could help them anyway. I thought maybe this was the guy Maz was referring to, but they made it clear that he was not. The only redeeming part of the entire trip to Crait was the final shot of the film. The final shot with the young boy and his broom looking toward the sky, much like the young Luke did so many years prior, was a beautiful ending to the film. The boy also had used the Force to grab his broom (something I hadn’t noticed on the first viewing). The boy was wearing the Resistance ring given to him by Rose. That was the only good thing to come out of the entire sequence on Crait. I loved just about everything involving Kylo Renn, Rey and Luke Skywalker. These were easily the most entertaining arcs of the film. Mark Hamill was just amazing as his iconic character. However, he was not playing the Luke Skywalker that we were used to seeing. This Luke Skywalker was a broken, sad, battered man who had hidden himself away to die because of his ultimate failure in training Kylo Renn. Hamill, who had publicly criticized some of the choices about Luke, brought his best work in years, if not ever. You could see the pain, anger and anguish in every word or look. And yet, he still broke back into the old Luke when he first saw R2-D2, his old friend. One of Luke’s best scenes came with the film’s best cameo. We got to see Yoda, as a Force Ghost, show up to give Luke one more lesson. This was puppet Yoda from Empire, not the pristine Yoda from the prequels, and the way this Yoda carried himself was wonderful. The return of Frank Oz to voice the iconic green character was another treat. The dynamic between Luke and Yoda brought you right back to the days of Empire Strikes Back and Dagobah. I also did not mind the end of the road for Luke Skywalker. When he died on the island planet, I was sad, but the idea that he went out with purpose and peace is a good way to go. He does not end up being violently killed by anyone. Instead, he decides that it is just time. Of course, one could argue that the Force projection is what was eventually what led to his death, and that would be alright with me too. My guess is that we see Force Ghost Luke in the final Episode IX. Rian Johnson does an incredible job of setting up our story for the future of the franchise, I sure hope that JJ Abrams is able to take some of the ideas that Johnson began with and create a satisfactory conclusion to the Skywalker saga.